Never have we seen a deal this good--not at auctions, trustee's sales, tax sales, foreclosures, divorce sales, or any other highly motivated seller. How's this for a good deal--a $2 million home--ABSOLUTELY FREE! You've likely seen the massive promotional campaign launched by Home & Garden Television featuring their "Dream Home" giveway. Each year, HGTV builds a luxury home someplace beautiful, and they give it away to one lucky family. This year the HGTV Dream Home is in Midway, Utah just 15 minutes outside of Park City. The home is located in a spectacular setting, walking distance from the Blue Ribbon Middle Provo River, and under the shadows of Mount Timpanogos--the tallest peak in the Wasatch Mountain Range. Total sales volume exceeded $1 billion for only the seventh year in the history of Park City and Deer Valley real estate. Median single family home prices increased for the second straight year. 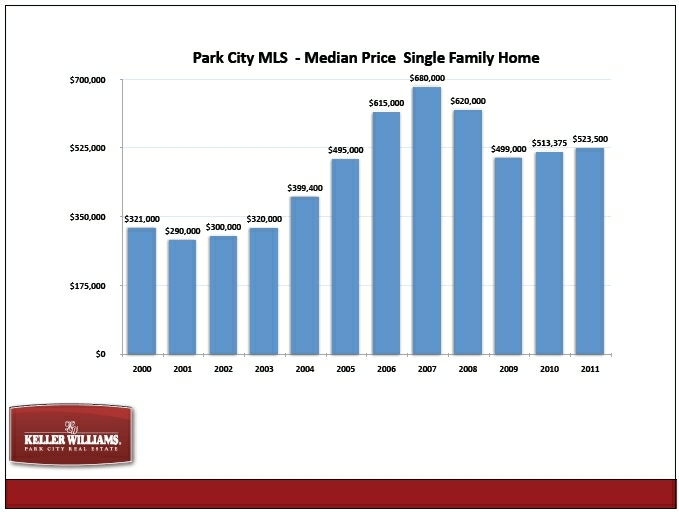 The median home price on the Park City MLS is now $523,500. 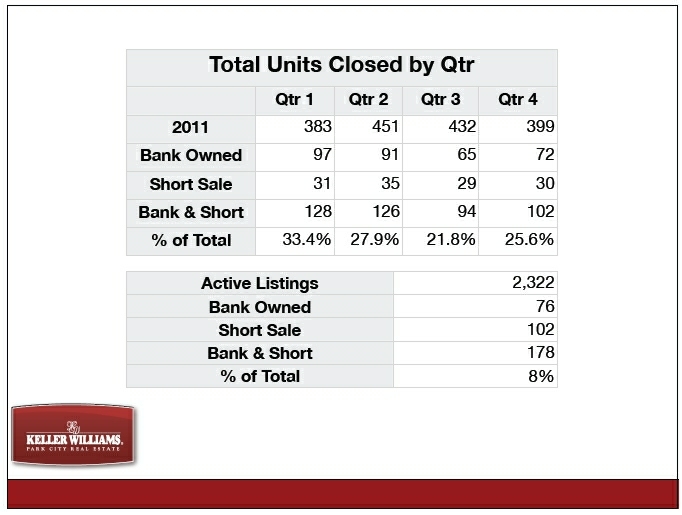 Short sales and foreclosures accounted for 8% of the active listings on the Park City MLS in the 4th quarter of 2011, but they represented 25.6% of the closed transactions. 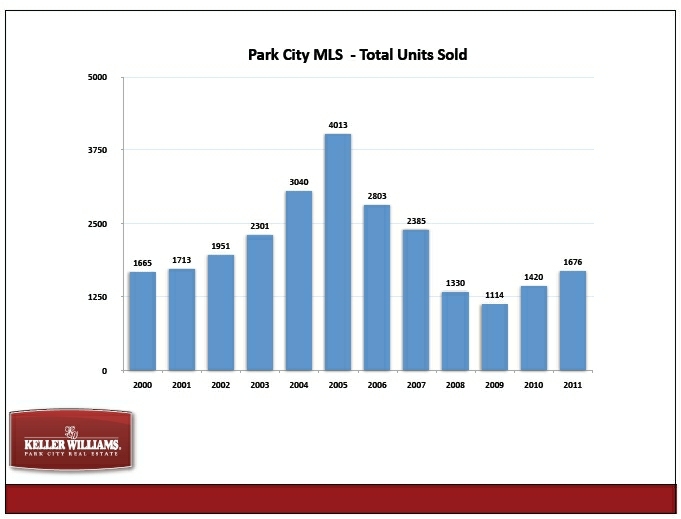 The number of properties listed for sale across the Park City MLS dropped again this quarter. 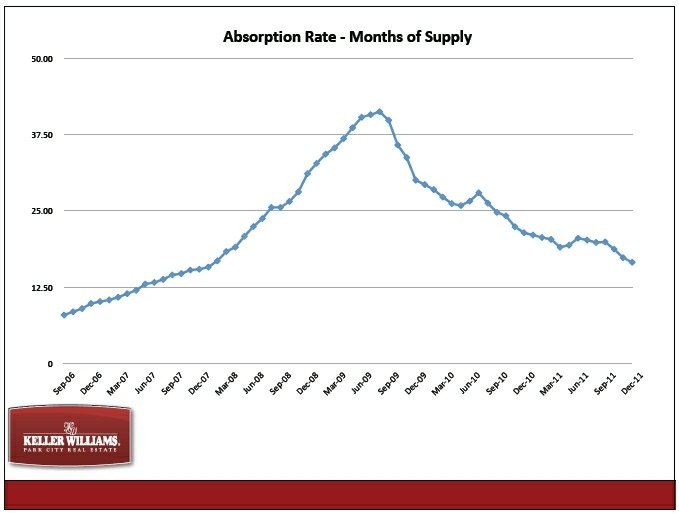 It's now very clear that the market has bottomed and started to recover--there is only a little over one year of supply based on the 2011 absorption rate. This is down from nearly 40 months of available supply at the market lows. Your chances of selling can be dramatically greater than this. 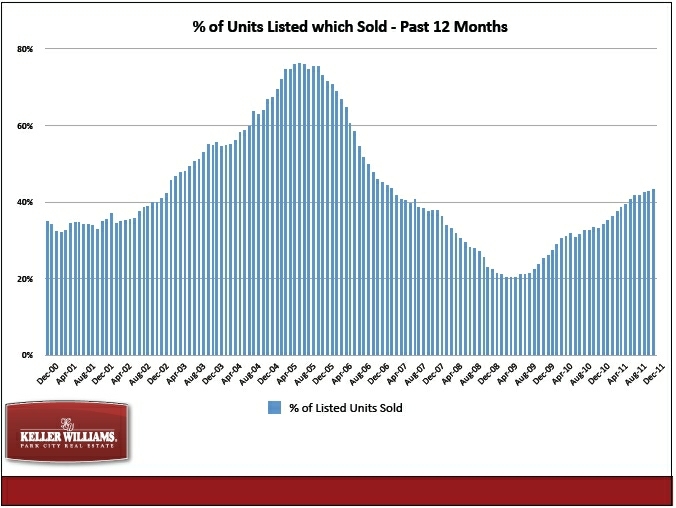 Our team actually sold 71% of the properties that we listed last year--nearly twice the average. Most of these graphs are backwards-looking, so what data can we look at to help us estimate where prices are heading in the near future? Based on the available inventory rapidly shrinking in many, if not most, Deer Valley and Park City neighborhoods it won't be long until median and average prices begin to move upward with more velocity. 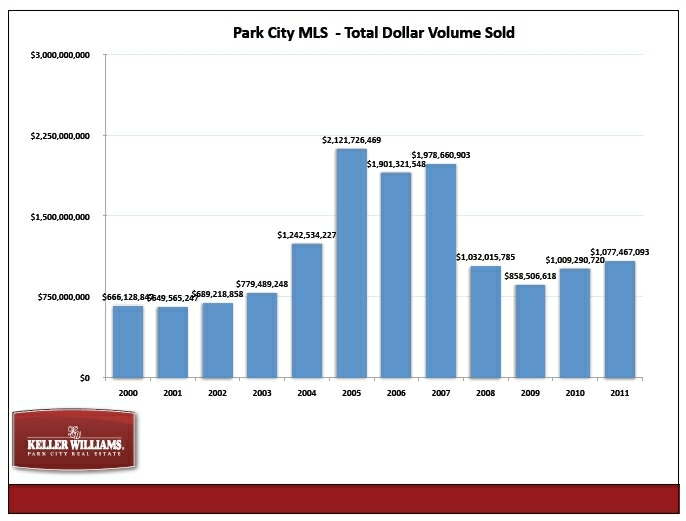 You can download a pdf of our complete folio of 4th Quarter 2011 Park City Real Estate Market stats and graphs here. This update should please Deer Valley bargain-hunters! Remember back when St. Regis Deer Valley was pre-selling condos back in 2005-2008 while the resort was under construction? No surprise--given the volatile economy--some of the prospective purchasers who had St. Regis condos and residences under contract were not able to secure financing, and they did not complete their purchases. Here's why their misfortune spells opportunity for you! Some of these buyers forfeited their earnest money deposits--to the tune of hundreds of thousands of dollars per unit. Since the developer retained (and rightly so...) deposits from some of the failed sales, these units might be good targets for acquisition at great prices! We have no authority to represent how the developer might respond to any aggressive purchase offers...but we strongly believe that this could be your best chance ever to acquire a St. Regis Deer Valley condo at the lowest possible price. Please email us for more info and let's discuss the possibilities. Let's be really clear... Park City Real Estate Guide® does not represent the developer or operator of the St. Regis Resort & Residences, Deer Crest, nor is Keller Williams Park City Real Estate the listing brokerage for the project. We are in no way affiliated with or authorized to speak on behalf of the owner, developer, or operator of the resort. We are simply expressing our opinions about trends and opportunities we see in the Deer Valley and Park City real estate marketplace. In short, these luxury condos are walking distance to the slopes at Deer Valley resort as well as the St. Regis and on the free bus line just a couple minutes from Park City's Main Street. We have helped a couple buyers secure fantastic deals there in the past few months and now there is some extreme motivation on the part of the bank that owns two units there. Seems the bank has bumped up against its debt limit and they are now being forced to fire sale their remaining units in Red Stag. There will be a 20% price reduction on these two units in the next couple days. These are two bedroom, three full bath beautifully appointed condos with private hot tubs and full kitchens. 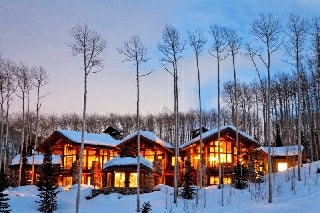 One more great Deer Valley buy is higher on the mountain in the Ridgepoint complex. These upper Deer Valley condos offer ski in and out access to the complex, great views, as well as tennis courts and a pool. If you have been waiting for the right time to get a great deal in Deer Valley, your time has come! We just finished crunching the numbers for some of Park City, Utah's hottest luxury neighborhoods, and the reduction in available luxury ski homes is staggering. Yes--you heard that correctly. There's now a real scarcity of well-priced properties in the luxury market between $3-6 million. We hope you paid attention to the math and noticed there was a missing sale...there was an additional closed sale of an unlisted property to an Hollywood A-List Couple. 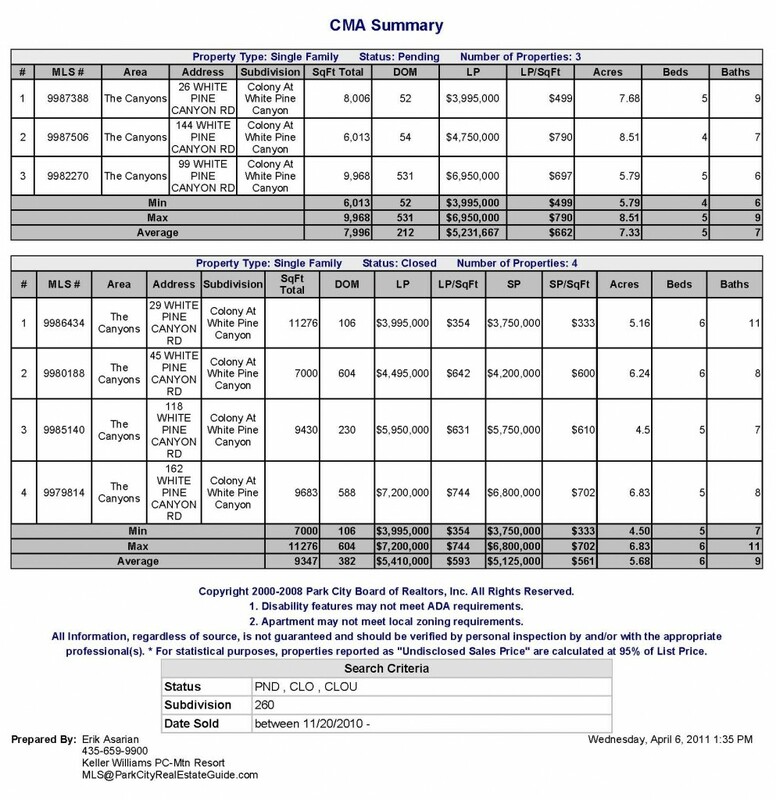 What's currently available for sale in The Colony at White Pine Canyon? As you'll see above, there are only a couple of options left under $5 million. One is debt-free and motivated to sell. The other is still living in fantasy-land regarding the value of their property in today's marketplace. 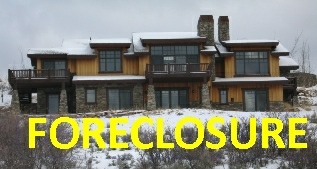 It is over-encumbered, and could be headed towards a Trustee's foreclosure sale. Promontory Real Estate Update: Best Deals Going...going...almost gone! Montage had been pre-selling residences during the challenging economy of 2010, and began the ski season with three pending sales. The developer kept to their construction schedule, and the first owners of Montage Deer Valley Residences took possession of their condos in late December 2010. Deer Valley Montage: "Build it and They Will Come!" As the ski season progressed, so did sales momentum at Montage Deer Valley. So far, 5 Montage Residences have sold, and 5 more are pending sale, bringing the total number of sold/pending Montage Deer Valley residences to 10. On top of those ten sales, the developer is working with prospective buyers on a couple of additional sales. Want More Montage Deer Valley Info? Please send us a quick note and we'll help you quickly and easily learn whatever you want to know about Montage Deer Valley. 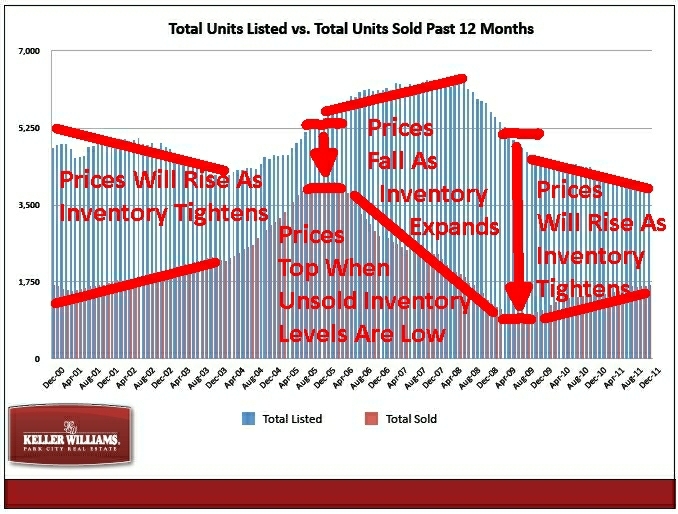 Inventory is being snapped up by savvy buyers, at great prices, and is not being replaced. Many of these great deals have been distressed sales, or simply very motivated sellers, but the buyer's advantage in Park City may be nearing its end. In Hidden Meadows, Deer Valley, there are only 2 homes on the market today...and 5 sales over the past year. 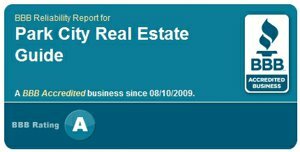 In The Colony at White Pine Canyon, inventory was reduced by more than 42% in the past 120 days. How much more evidence you need that many neighborhoods in Park City have hit the bottom and prices will turn around soon? 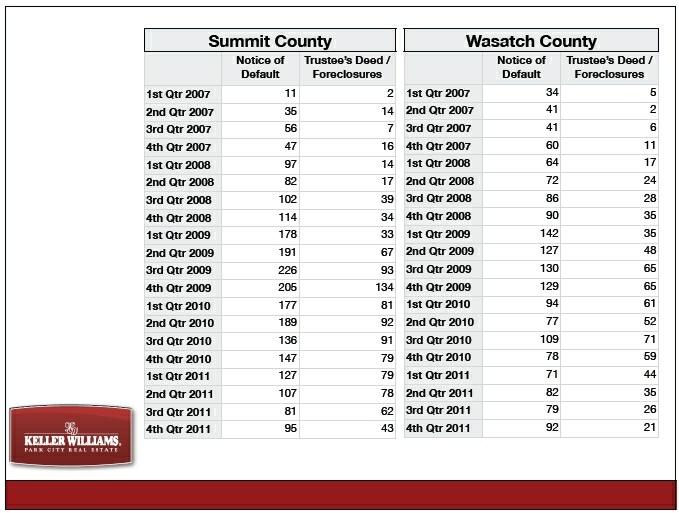 Pre-Foreclosure Notice of Defaults and Trustee sales are down markedly in Summit County, Utah. That is not to say there will not be more foreclosure properties that come to market, but they will be fewer in number and the competition for them will be greater. Already this year we have seen numerous multiple offer scenarios on bank owned properties as soon as they hit the market. If you are not actively following the market; or, more importantly, don't have a local real estate agent working for you, you frankly do not have a chance of scoring the great deal you are dreaming about because the competition is too fierce for the best deals. One telling example of the change in our market that began last year and is really manifesting itself now is at Promontory. This luxury golf course development has been through well documented travails in the past, however, the jokes of a couple years ago regarding inventory there are long forgotten. The future is bright and the days of buying homes for pennies on the dollar there are numbered. Bank owned inventory is down to its lowest level in years, with just a couple bank controlled properties now on the market! 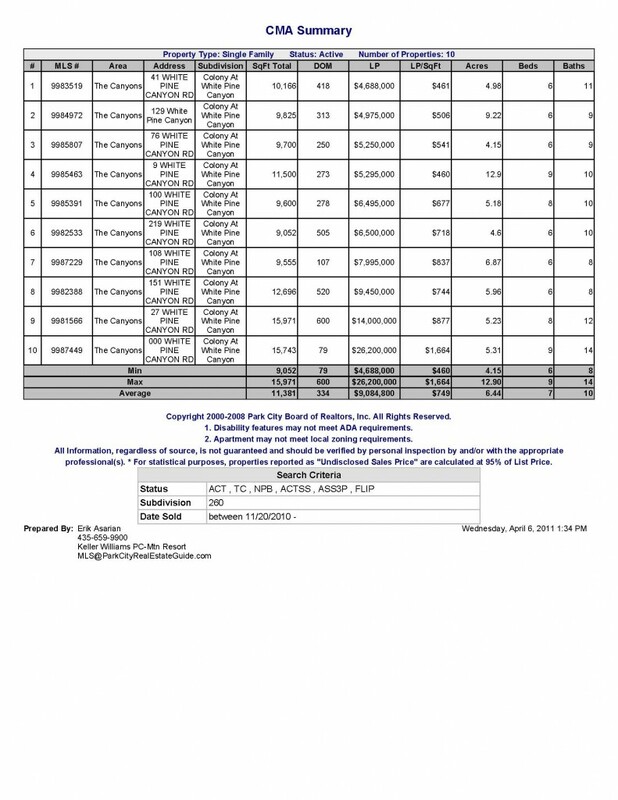 A membership drive offering incentives available through the end of April 2011 (call us for details) and a forthcoming new clubhouse are adding value, convincing more and more buyers that the time is now to pursue the dream of owning a piece of this world class resort community. This year could very well be the turning point in Park City...what are you waiting for? Allow us to help you achieve your goals. Call or email us today and tell us what you are looking for in a Park City and we will help you make it a reality. Many already know about Utah's embarassing plethora of skiing options, the fantastic weather and the feather light powder might but let me illustrate a few of Utah's skiing finer points for the uninformed (like those who continue to suffer through Colorado ski vacations) by using some of the results from Ski Magazine's Reader Resort Survey. I kid the Coloradans, it's a beautiful place and if you have plenty of time to travel not a bad place to visit, but having lived in both states I don't think there is much of a comparison when it comes to recreation. Rounding out the Park City resorts, Park City Mountain Resort was ranked 5th overall and the Canyons was ranked #18. My bold prediction...The on mountain improvements the Canyons is making this year will enable it to challenge for the Top 10 next season. Access: (What could be more important except perhaps Snow?) Seven of the top ten most accessible resorts were in Utah. Seven. Seven to Utah and Snowbasin and Powder Mountain were't on the list! Snow: (Arguably the most important category for snow sliding enthusiasts) Seven of the Top Ten rankings went to Utah Resorts. One to Colorado. Value: (Need we say more?) 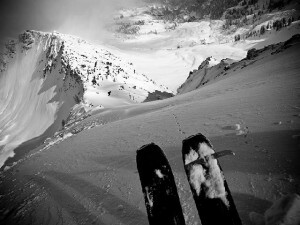 Five of the Top Ten to Utah resorts. Utah is a skiers paradise and Park City is Mecca. Come see for yourself this winter and experience what you have been missing. Oh, and to sweeten the trip how about a free Park City lift ticket on your arrival day? We welcome your questions and comments. If you come to Park City this winter, be sure to visit us in our offices in Deer Valley Plaza. Click the photo above to watch the video! Photo and video courtesy of Ian Provo Photography. By the way, if you ever need any professional real estate photography, Ian Provo is the guy to call!